Unlike companies like Apple, Inc. who move all at once from one product generation to the next, many OEMs base their value and reputation on customizing their product offerings to various clients and applications. It’s in their DNA to tweak and expand designs to deliver exactly what their customers need. This strategy can be very effective, however it comes with a natural consequence: a wide portfolio of legacy products that requires active support for many years. It doesn’t take long to create dozens or even hundreds of custom devices. And as the Service Managers for these OEMs attest, the more products they support the less they can accurately predict ongoing demand for any given device. Fortunately with the right CM partner there is a way to meet the challenges that come with legacy products. Knowing what – and how much – to keep in stock is a perpetual guessing game. You need a CM partner who can flex quickly to build your small batches of legacy electronics. The right CM doesn’t impose pressure to forecast demand. Instead they rapidly build exactly what is needed at the time and no more. This matches your own design philosophy by supporting as wide a product portfolio as you want. In legacy work this comes with the territory. Find a CM partner who scours the world to find components, anticipates supply problems, and recommends replacement parts (with your approval) when needed. The right CM owns this challenge alongside you and doesn’t simply toss the obsolescence problem back in your lap. Somebody made a bad guess and now you’re holding stock of a legacy product that isn’t moving. Or the wrong CM forced a last-time-buy on you. A good legacy CM partner will convert these assemblies into another version for you, on demand, in the batch size you really need so you can free up your cash. Your engineers are busy designing the next generation product line(s) and have little time to devote to supporting the older ones. Or perhaps you bought a business/product line and its development expertise is long gone. The right CM partner fills in these gaps by paying attention to quality and manufacturing issues on your behalf – and involving you only when needed to assure continuous supply. You would have preferred not to build your own legacy or other small batches but felt forced into it because of poor service in the past from more traditional CM’s. The right CM partner has helped OEMs like yours reduce major cost and hassle by giving them the confidence to get out of inefficient and expensive in-house manufacturing of older, infrequent systems. 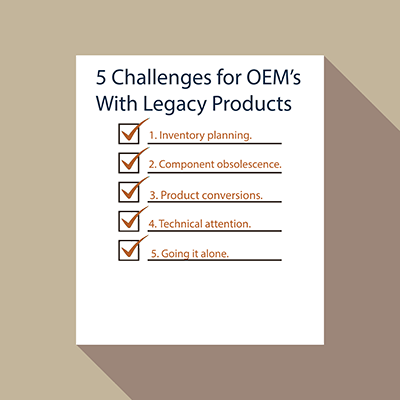 For an example of how RBB has helped one such OEM with their legacy support challenges, download our case study.